Then: Teddy Ruxpin entered the toy market in 1985 as “The World’s First Animated Talking Toy.” Teddy was given life by Worlds of Wonder (WOW), a toy company founded by former Atari employees. Priced at $69.99, this electronics-powered teddy bear enjoyed top selling toy status in 1985 and 1986. The bear’s animatronics were powered by an embedded audio cassette player that ran on four C-batteries. Teddy Ruxpin cassettes re-purposed one of the two audio tracks to control the data-stream-driven servo-motors, allowing his eyes and mouth to move in concert with the audible story. Over 35 different story sets wee available for Teddy. Each consisted of a 20-25 minute audio cassette and accompanying hardcover book. Each story was duplicated on both sides of the tape, a way of making the setup more kid-friendly. 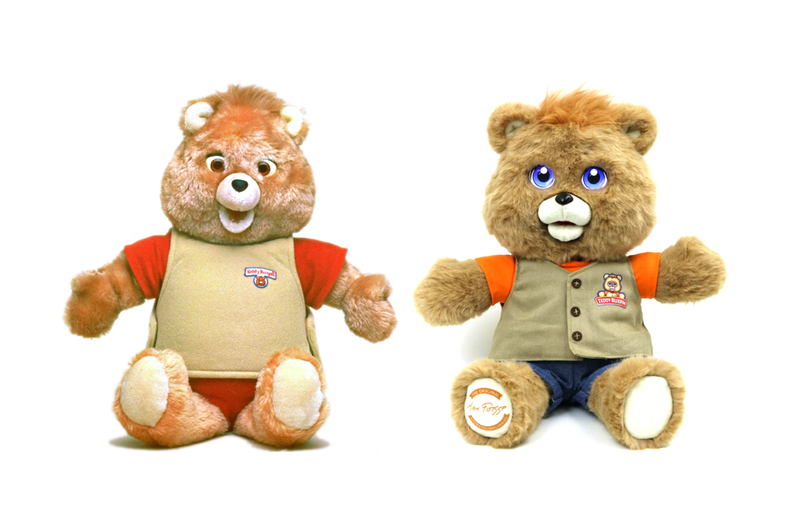 Teddy Ruxpin’s popularity led to a TV series and a slew of licensed products. Unfortunately, some dubious financial decisions resulted in WOW’s demise during the Black Monday stock market crash of 1987. The company eventually went bankrupt in 1988 and the rights to Teddy Ruxpin were acquired by Hasbro and produced under its Playskool line until the mid 1990s. Since that time, Teddy has been adopted by two smaller toy companies, YES! Entertainment, and then BackPack Toys. Through it all, Teddy Ruxpin remains popular with vintage toy collectors. A sizable collector’s market for him thrives on sites like eBay and Etsy. Now: Wicked Cool Toys has announced plans to relaunch the Teddy Ruxpin brand in 2017. Their new, modern take on the toy bear includes a major technology upgrade: an integrated internal 4GB hard drive, LCD eyes, and touch sensors. Specs suggest that Teddy will be able to store an estimated 40 stories, with each lasting 15 or 20 minutes of play time. He’ll come pre-loaded with 10 stories. Instead of a hardcover book and cassette, kids will now experience story time by following along on smartphone or tablet app. His LCD eyes will blink and flash while his motorized mouth will provide over 40 different animated expressions. The new Teddy Ruxpin will hit store shelves in Fall 2017 at a price of $99.99.